After a two-month voyage across three Great Lakes in the Naper brothers' schooner, the Telegraph, Joseph Naper and his family arrived on west bank of the DuPage River in July of 1831. Before the city of Chicago even incorporated, there were 2,000 people living in Naperville, spreading out from the first settlement into the prairie. Since its founding, Naperville has always been a draw away from the confines of the city. In the 1960s it saw rapid population growth as the entire country bought into the dream of urban work, and suburban living. And with the construction of the Reagan Memorial Tollway, that population quadrupled to nearly 150,000 in the past twenty years. With many of America's largest suburbs turning inward for economic growth, places like Naperville have become largely self-sufficient, fueling the small surrounding economies with their own brand of localized production and consumerism. And suburban breweries are proving to be a vital part of that economic engine, forming a fertile crescent around the City of Chicago. A little over a year ago, Solemn Oath Brewery established a 15BBL production brewery in Naperville along Ogden Avenue. In a stretch dominated by car dealerships the size of farms, Solemn Oath is proving to be a draw, attracting craft beer consumers to a new part of town. Now eyeing up a spot along this same corridor is Standard Market, a high-end grocery concept with a location in Westmont, IL that has an unparalleled selection of craft beer, wine, and house-made products like cave-aged cheeses that would make Whole Foods' mouth water. 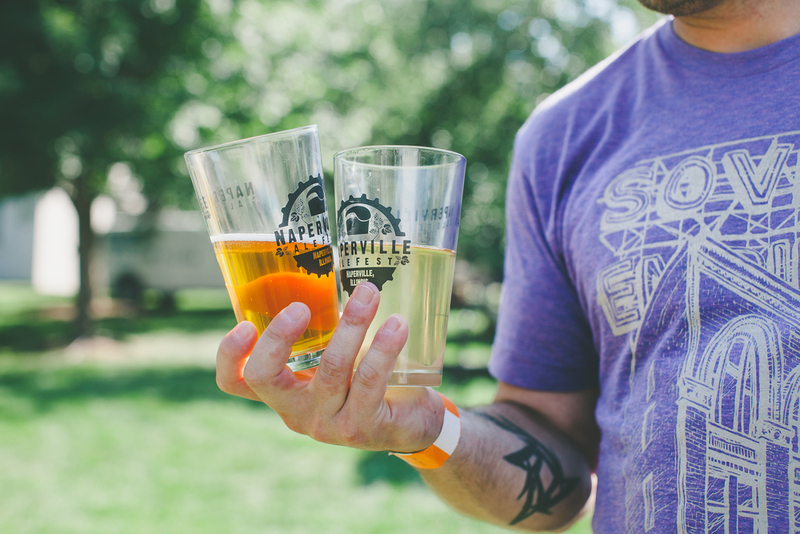 The Naperville Ale Fest is very much a part of this economic momentum that craft beer is helping to provide. 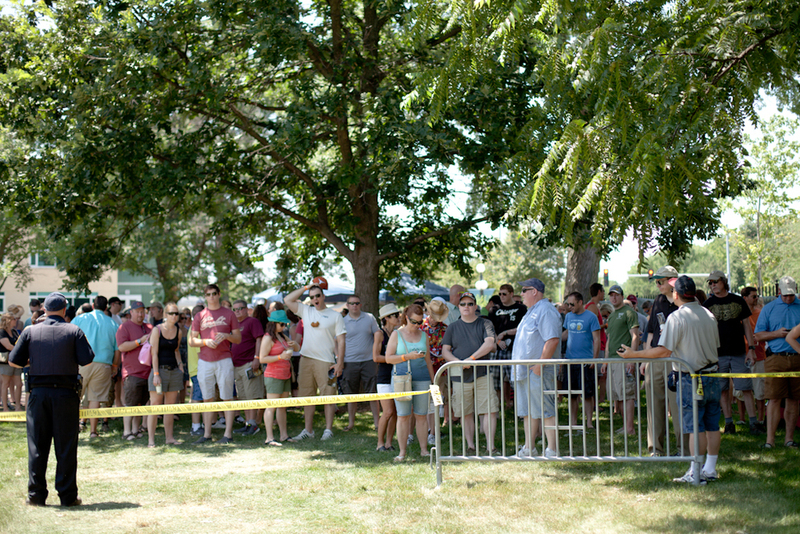 Established by Joshua Seago and his partners at Lou Dog Events, the Naperville Ale Fest sought to bring a premium craft beer experience to the Naperville community that would not only compete with the largest festivals in the city of Chicago, but establish itself as part of the new wave in beer festivals overall. The Naperville Settlement, where Joseph Naper came ashore over 180 years prior, served as a stunning backdrop for a luxurious layout, offering plenty of green space for over 4,000 people. Even at its peak, the lines were short, small gatherings under the trees were plenty, and access to water, food, and shade was ample. Seago's logistical planning was thorough. And where planning proved insufficient (ice for jockey boxes was limited for the first hour on a 90 degree day) Seago's team provided some old-fashioned hustle to catch up (two more pallets of ice arrived within the hour and were distributed by a small army of golf carts). The ice suppliers weren't the only small businesses with a festival boon that day — in all, Seago worked with over 30 local businesses in the area to pull off the event. The crowd was a beautiful example of what the mainstream craft beer consumer looks like — in that it didn't look like any particular person at all. Men and women, young and old, bearded and the newly shorn were in attendance. This felt like a community coming to celebrate its love of craft beer, as well as satisfy its curiosity. While the suburbs are certainly gaining ground in the craft market, its still widely underserved in terms of variety. Seago aimed to bring an enormous number of breweries and beers from all over the country. 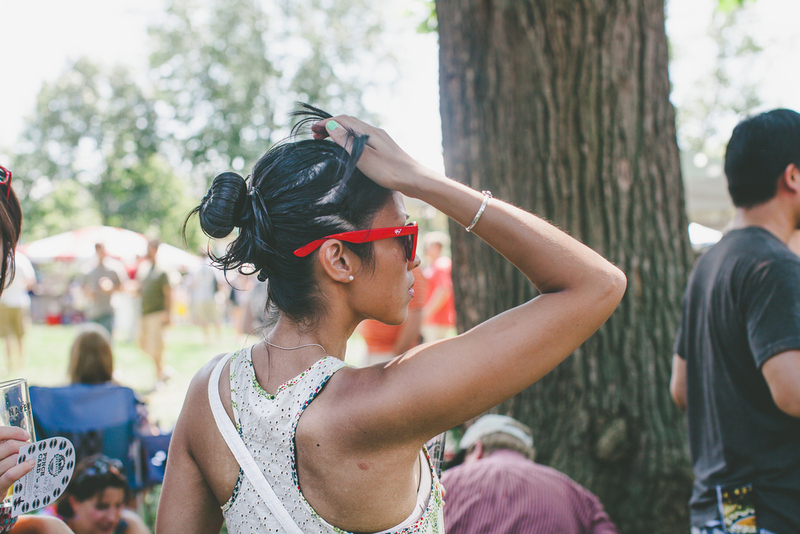 According to Seago, there were 91 brewers and 210 different craft beers offered to festival goers. The crowd came from far beyond Naperville as well. A perfect example of the draw that a craft beer fest can create, Seago had visitors from Arizona, MIssouri, even Colorado. The country's larger festivals like GABF in Colorado and Great Taste of the Midwest in Madison, WI are known for their national attraction. But the local tourism and economic radius for a festival of this size, with this kind of pull, is almost unheard of in its first year. And it has plenty of room to grow. A major reason the festival ran so smoothly, and holds such promise, is because the city of Naperville itself proved to be such a valuable partner. The city's inherent conservatism crated some collaborative back-and-forth on some of the details, such as pour sizes, number of tickets, and access to abundant food and water. The city wanted to ensure that everyone had a quality, safe experience in one of its most treasured parks. Day-of, the police and fire departments were on hand to direct traffic, usher festival goes across buy streets to the entrances, and even pitched in to take tickets, check IDs, and stamp hands. The city was a huge part of the day's sense of ease — helping prevent a booze fest, and create a sense of community instead. And oh, the rare beers. Both the VIP tent and the general admission rare featured two rare beer lists sponsored by Good Beer Hunting. About every 30 minutes throughout the day, another amazing beer tapped, including Widmier Brother's SXNW, Vandermill's Ginger Peach, and Goose Island Bourbon County Coffee. There were over a dozen in all, and the list served as a great decision-maker for those festival goers that were overwhelmed by the enormity of the days offering. Forbidden Root, a new start-up brewing heritage-style "beer botanicals" made with roots and other special ingredients were on-hand all day in the VIP tent pouring the first-ever tastes of their namesake brew, Forbidden Root, approximating a sophisticated root beer or sarsaparilla flavor, but with the true body and quality of a brewed beer. Their second offering of the day, Sublime, was a ginger root, key-lime and honeybush brew that more than a few drinkers expressed was the best beer they've ever had. In all, the festival was a huge success. And with plenty of positive feedback, requests, and suggestions for next years' fest, Seago has established what is likely to become a serious suburban tradition for years to come. He's already hatching plans for a number of events over the winter, as the Lou Dog Events business takes off. I was proud to be a sponsor of the fest this year, and I'm proud of the entire city of Naperville for their turnout and collaboration in making it such a damn good time.